This special cocktail reception was held in honor of Roberta Kane, the daughter of Mike and Sallie Gordon. The Gordons were pioneers of Las Vegas' Jewish community and founding members of Temple Beth Sholom. 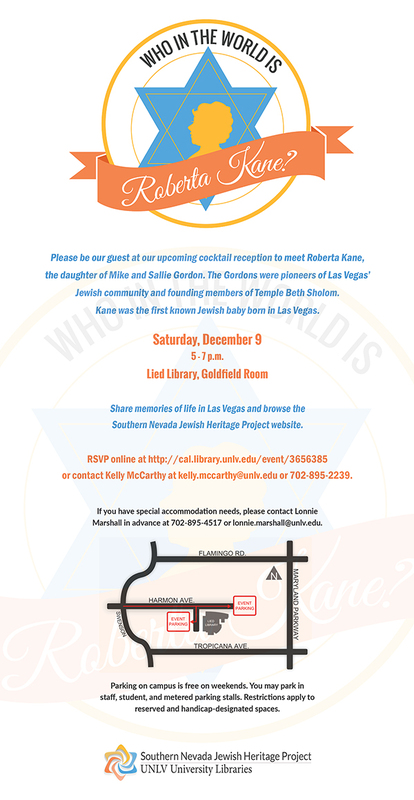 Kane was the first known Jewish baby born in Las Vegas. Due to the National Finals Rodeo (NFR) happening at the Thomas & Mack Center, we wanted to provide you with some additional traffic and parking information. Parking restrictions are not enforced on the weekends. This means you may park in any parking space labeled Staff or Student as well as any space with a parking meter with no payment required. The only restricted parking spaces are those spaces with a Reserved or Handicap sign posted (unless, of course, you have a handicap placard). Because the NFR will be happening at the Thomas and Mack Center the night of the event, we anticipate heavier traffic around the UNLV campus and in parking lots. In an effort to avoid the traffic we recommend the actions listed below. Please note Thomas and Mack staff will be charging for parking in the parking lots on campus. If stopped by a Thomas and Mack staff member inform them you are attending an event at the library. They will let you pass without charging for parking. Avoid Thomas and Mack Drive and all areas surrounding the Thomas and Mack Center. Use parking lots along East Harmon Avenue or along Maryland Parkway. Please note the parking lots along Maryland are further away and will require a longer walk to Lied Library. Carpool or take a taxi or ride-sharing service life Lyft or Uber. PLEASE NOTE: DO NOT TURN ON TO HARMON AVENUE FROM MARYLAND PARKWAY; HARMON DOES NOT CONTINUE ACROSS UNLV’S CAMPUS. ALSO, PLEASE DO NOT ENTER FROM TMC DRIVE OFF OF SWENSON, OR WILBUR. YOU Will NOT BE ABLE TO GET AROUND TO LIED LIBRARY. TARKANIAN WAY WILL BE CLOSED DUE TO THE NFR. · Travel approximately half a mile; Lied Library is on the right, just before Harmon ends.